The artistic juices were flowing right from the start of our first 2019 School Holiday Program! Our South West crew create gorgeous accessories and explore sensory play in Week 1. On Monday we kicked off the program with an art activity with a twist. 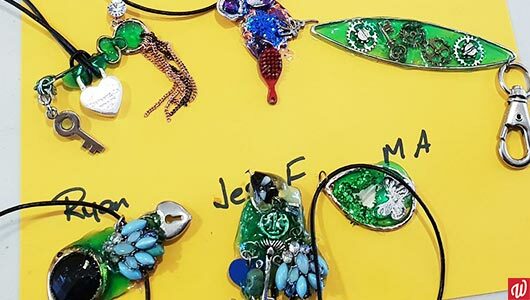 Participants made their own keychains and accessories out of recycled jewellery and materials. 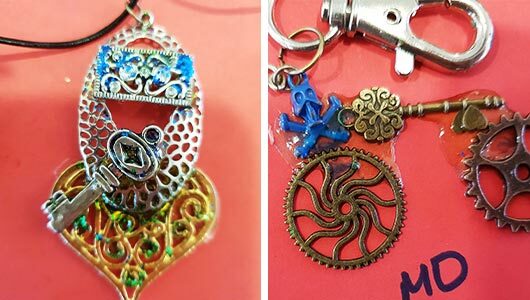 As a result they created some amazing steampunk pieces – take a look at that sparkle! The children really used their imagination to come up with some delightful creations. For example they made a BMX bike figurine, a love heart necklace, and a surfboard keyring. Participants enjoyed being inventive and thinking outside the box to create their masterpieces. We used a 3D gel maker to glue the materials together, which most had never used before. The hardest part was having to wait for the gel to activate before the accessories were finished! The children loved the activity and were excited to take home their creations to show their families. One of the children, Joe, simply could not wait to present his mum with a keychain for her car keys. The next day participants got their hands dirty with a sensory play activity. By adding different essential oils, glitter, and other materials to homemade playdough, it became a feast for the senses. Each child chose their own colours to add their dough, and enjoyed exploring the different smells, textures, tastes, and colours they could make. This is a relaxing activity that works well for children who are easily stimulated. The participants again harnessed their imagination to create pieces of food, animals, and funny faces out of the playdough. In this first week alone we’ve seen everyone come together and have a go at art and crafts. We see the children grow comfortable and confident as they try activities for the first time within a supportive environment. Even our staff are having an amazing time learning new techniques! There’s more creative projects, team games, and outdoor activities in store for our participants next week. Stay tuned for more! Our School Holiday Program runs during school holiday periods and offers plenty of fun and engaging activities. If you’re interested in our next program contact Bithika Kastha here or on (08) 9445 6552.